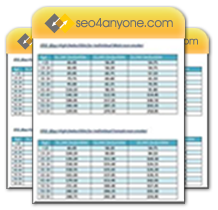 Seo4anyone now adds white label marketing services for E-Commerce vendors in addition to their existing white label programs for traditional marketing agencies. Seo4anyone Inc., a well-known SEO company in Miami, has introduced white label internet marketing services for agencies and E-Commerce vendors. The SEO and internet marketing experts can provide online marketing personnel for their strategic partners through their white label program. E-Commerce tool providers are the most recent beneficiaries of this program as they are looking for new ways to keep their customers loyal to their platform. In many cases, the customers pay a monthly fee to the E-Commerce vendor but there are no additional tools to the client to grow their sales and revenue on that platform. By offering their clients a new set of revenue generating services such as SEO, PPC, social media management, email marketing and website optimization, the vendor now controls more aspects of the client relationship and builds a longer-term bond between their organizations. A white label services program removes the risk of the E-Commerce vendor or agency from having to hire internal employees who are experts in those marketing tactics. The staff members of seo4anyone act as employees of the partners’ companies and the client never knows there is a 3rd party agency involved. This allows the partners to retain their current clients and keep them from going to another vendor. This helps them compete against larger agencies and larger E-Commerce vendors in the marketplace. As part of its white label reseller program, seo4anyone trains their partners’ sales teams how to bundle online marketing projects, re-allocate client budgets and focus on high value ROI projects that make sense for customers. “We train our partners how to set the clients’ expectations for results for each type of project. Setting the proper expectations is the key to a healthy relationship between partners so that no one gets thrown under the bus down the road,” says Matt Silvers of seo4anyone. As part of the marketing program, seo4anyone provides webinars to the customers of their white label partners. This builds more trust and authority for the agency or E-Commerce vendor and helps to educate their customers on the different types of online marketing projects available. They work with local small businesses as well as large multinational companies with websites in multiple languages. This Florida SEO company specializes in assisting both American and Latin American customers with their online marketing campaigns. Seo4anyone offers several core competencies in their reseller program. They offer Search Engine Optimization (SEO), Pay Per Click Management (PPC), Social Media Marketing (SMM), viral marketing strategies, landing page conversion testing (A/B testing), website optimization testing and website design and development. The company has earned a reputation as a top SEO company in Florida through their frequent public speaking engagements for the Chamber of Commerce, guest lectures at the University of Miami Business School and local business groups in the area. Their unique blend of technical, experienced consultants and creative internet marketing skills set them apart in the Miami/ Ft. Lauderdale area in South Florida. They are currently expanding their employment search throughout Florida to find only the most talented online marketers for their white label services program. Seo4anyone is a full-service internet marketing agency based in Miami, Florida. They provide affordable internet marketing plans to help local small businesses as well as large multinational companies with their marketing strategies. The company specializes in Search Engine Optimization (SEO), Pay Per Click Management (PPC), social media marketing (Facebook, Twitter, YouTube, LinkedIn), viral marketing strategies, landing page conversation testing (A/B testing), website optimization testing and website design and development. For more information, please visit http://www.seo4anyone.com.